We are Guy's home bookstore! Personalized copies of Wise Guy are available because Guy comes into the store all the time. Please add your instructions in the Order Comments section of your order. Bulk discounts may be available. Silicon Valley icon and bestselling author Guy Kawasaki shares the unlikely stories of his life and the lessons we can draw from them. 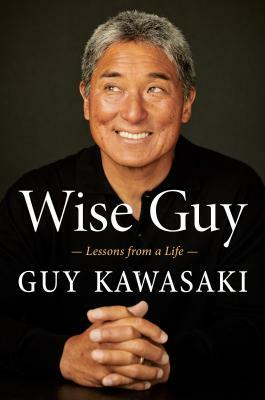 Guy Kawasaki has been a fixture in the tech world since he was part of Apple's original Macintosh team in the 1980s. He's widely respected as a source of wisdom about entrepreneurship, venture capital, marketing, and business evangelism, which he's shared in bestselling books such as The Art of the Start and Enchantment. But before all that, he was just a middle-class kid in Hawaii, a grandson of Japanese immigrants, who loved football and got a C+ in 9th grade English. Wise Guy, his most personal book, is about his surprising journey. It's not a traditional memoir but a series of vignettes. He toyed with calling it Miso Soup for the Soul, because these stories (like those in the Chicken Soup series) reflect a wide range of experiences that have enlightened and inspired him. For instance, you'll follow Guy as he . . .
* Gets his first real job in the jewelry business--which turned out to be surprisingly useful training for the tech world. * Disparages one of Apple's potential partners in front of that company's CEO, at the sneaky instigation of Steve Jobs. * Blows up his Apple career with a single sentence, after Jobs withholds a pre-release copy of the Think Different ad campaign: "That's okay, Steve, I don't trust you either." * Reevaluates his self-importance after being mistaken for Jackie Chan by four young women. * Takes up surfing at age 62--which teaches him that you can discover a new passion at any age, but younger is easier! Guy covers everything from moral values to business skills to parenting. As he writes, "I hope my stories help you live a more joyous, productive, and meaningful life. If Wise Guy succeeds at this, then that's the best story of all." Guy Kawasaki is the chief evangelist of Canva (an online design service) and an executive fellow of the Haas School of Business at the University of California, Berkeley. Previously, he was the chief evangelist of Apple and special adviser to the CEO of the Motorola business unit of Google. His many acclaimed books include The Art of Social Media and Enchantment. He lives in Silicon Valley with his family and on social media where he has ten million followers.